Tears of joy, tears of pride, tears of remeberance. Sometimes it's hard to hold it in. 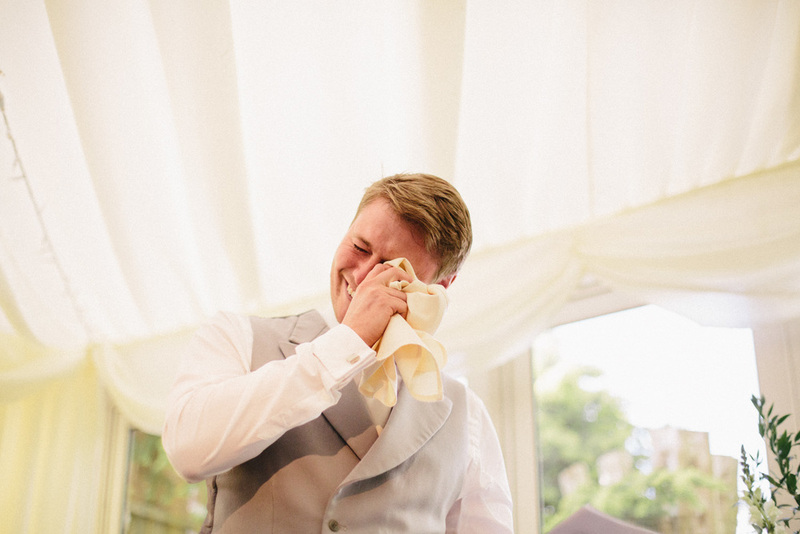 There's so many emotions I observe on a wedding day, and crying isn't uncommon! It's easy to see why. Couples and their respective families work and plan for a massive day, with so much meaning. When it comes to the big day, it can be quite easy for the bride, groom and close family to have a little cry, wether it's due to the happiness of the day, and everything coming together, or just the release of stress building up to the wedding! There's lots of "popular" moments when the tears show themselves! The brides parents and family, seeing her in the dress for the first time. The groom, seeing his bride for the first time at the alter and visa versa. The speeches, when speakers share their fun, sad or hilarious anecdotes, or sometimes when glasses are raised, remembering loved ones, who have sadly passed away. The majority of the time, my photography is instinctive. I will shoot almost automatically when I see a moment. But it tends to be different when tears are at present. Sometimes I have to make a conscious decision to either go ahead and photograph the sadder moments, or back off and respect the people involved. It is my job to capture the day as it happens, as authentically as possible, but sometimes I feel it's important to respect people's space and feelings.